It is a system of irrigation in which water is distributed in the form of spray like natural rainfall. In this technique, water is delivered through a system of pipe by pumping and then sprayed to the entire field. 1. Suitable for all types of field condition (except heavy clay soil). 2. Uniform distribution of water with high efficiency. 3. Less land loss provides more land area for cultivation. 4. Loss of water is minimum. 5. Accurate and easy measurement of distributed water. 6. Soluble fertilizers, herbicides and fungicides can be added in water before distributing to the crops. 2. The water must be clean and free of sand, debris and dissolve salts. 3. Cannot be used in windy climate. 4. Fruits/crops can be damaged due to excessive water. 5. Requires high and continuous power supply. 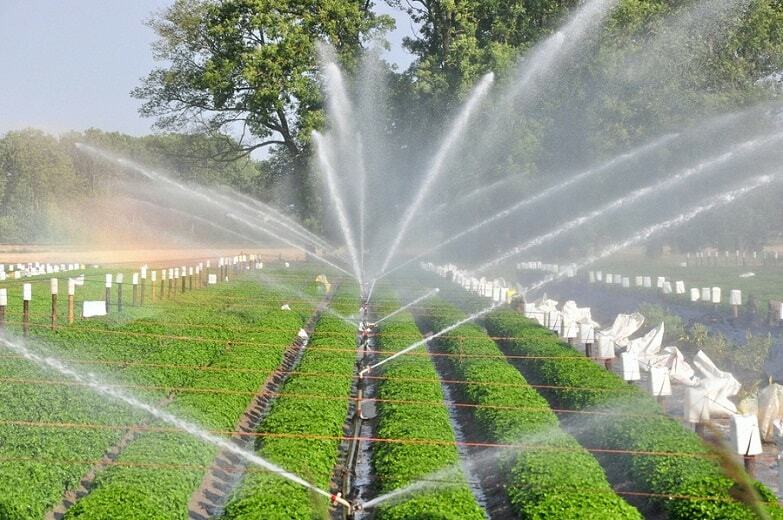 Also read – Drip Irrigation – Advantages & Disadvantages.